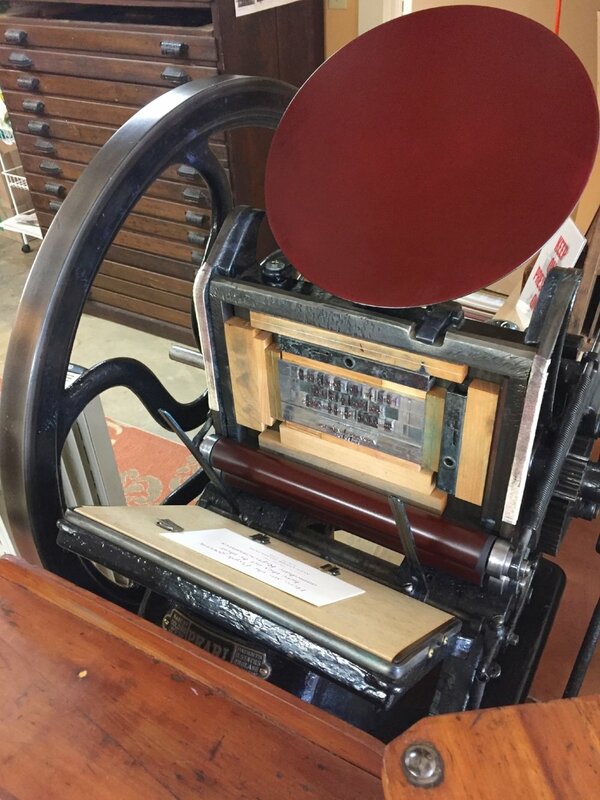 The constitutional guarantee of freedom of the press is something we’ve always taken seriously here at St Brigid Press. We’re grateful to be able to practice our crafts of printing and poetry in a free spirit and a free society. It’s important, however, to continue to be vigilant ~ to remind each other and our elected representatives of how precious and vital are our democracy and freedom. We have many wise voices, past and present, who stood up (or, like Rosa Parks, sat down) and spoke out for our inalienable rights. 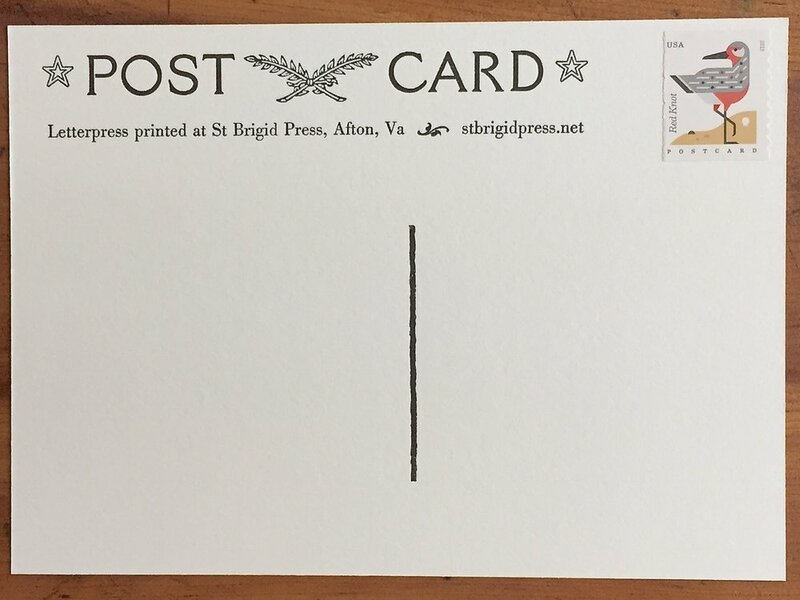 In honor of their voice ~ your voice, my voice, our collective American voices ~ we’ve created a series called The People’s Postcards. Alexander Hamilton was an immigrant from the Caribbean who, in his early 20s, found a job as an assistant to George Washington. He eventually became a delegate to the Constitutional Convention, helped author the Federalist Papers, and served as the first US Secretary of the Treasury. 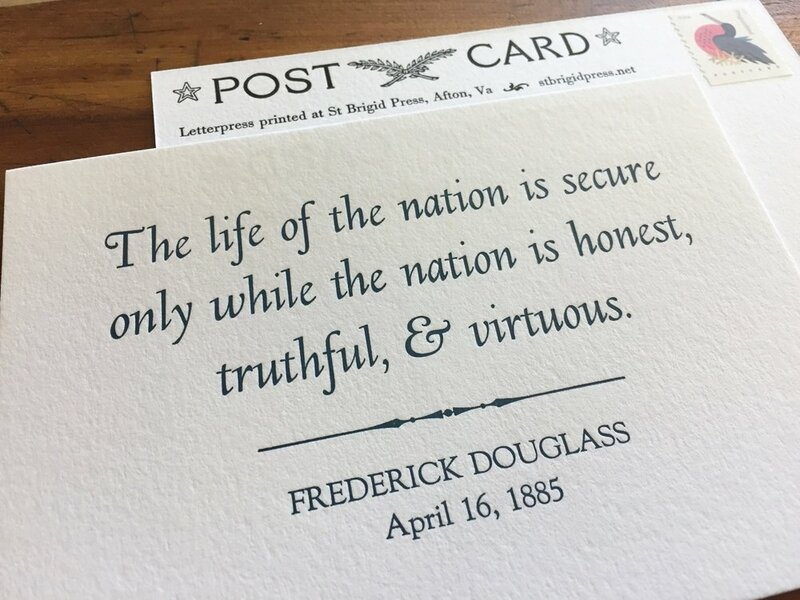 The quote on our postcard was part of a speech Hamilton gave at the New York state convention in Poughkeepsie, where he urged representatives to ratify the US Constitution. Born a slave in Maryland about 1818, Frederick Douglass became one of the most ardent and eloquent human rights activists and orators in US history, speaking and writing on behalf of African-Americans, Native Americans, women, and immigrants. He also became a government official and newspaper publisher. The above quote was part of a speech Douglass gave in the District of Columbia on the 23rd anniversary of emancipation in DC. Friends, we are the WE in “We the People…” Let’s keep up the good work of forming a more perfect union. Together.